I've met so many wonderful tea enthusiasts through blogging. Everyone is friendly, interesting, and of course passionate about tea. With a full time job and two children it is difficult to keep up with correspondence, but I value all the people I've met around the world who love tea as much as I do! One of these individuals is Niraj Lama from Happy Earth Tea. Niraj is a native of Darjeeling, who has found himself living in Rochester NY. Tea has always been part of his life. After a few email exchanges we discovered many similarities in our children, and of course discussed our love for tea. Niraj runs Happy Earth Tea with his wife Mary, where the focus is on sharing their love for tea with others. They use environmentally friendly packaging, and focus on organic teas. The company sells a large range of teas, and Niraj was kind enough to send me samples of some of this year's first flush Darjeeling. 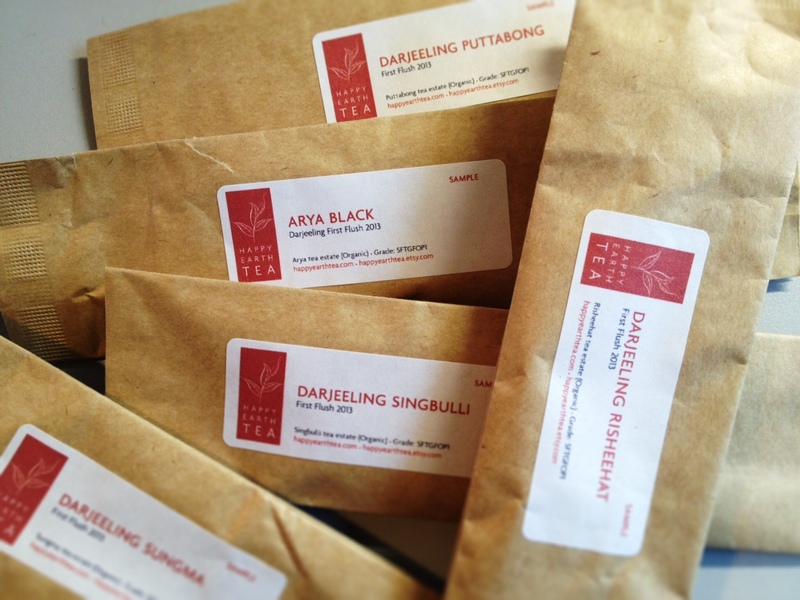 He of course has a special love for Darjeeling teas, and I was honored to receive such generous, gorgeous samples. The samples were large and packaged well to preserve freshness.The teas were an adventure for my palate- each tea was better than the next. The subtle, delicious floral notes were more complex than I had expected. There is a burst of springtime in every sip, floral and sweet. The teas have a briskness that I love, but are not bitter at all. These teas are such a joy to drink, I am so grateful for the samples! When tasting the teas in my office, the entire room was filled with the aroma of sweet flowers. Particularly amazing for these rainy springtime days. Savoring each sample slowly, I have tasted each one multiple times. Sitting and focusing on the subtle flavors is a meditative, peaceful activity. I loved each tea that I tried, and if I had to pick a favorite it might be the Singbulli. It has a dynamic range of flavor starting sweet, gaining in strength and ending with a gentle vegetal taste similar to a fine oolong. As I sipped it and looked out the window on a dreary day, I could feel an inner lightness. HET: I began my tea career as owner of Darjeeling Tea Exclusive that my wife and I set up in Darjeeling in 2005. Before that I was a journalist working for a Indian national daily. Before I met my wife I was just another typical tea drinker in India who drank endless cups a day without sparing a thought about why and what I was drinking. My wife who is originally from Washington DC had met me while sojourning in Darjeeling. Before we knew it we were married with kids and 10 years had gone by in India together. Darjeeling Tea Exclusive happened sometime before the kids were born. During our visits to the US we noticed the emerging market for tea. It was being seen as a healthy, holistic drink which spoke to us immensely because we were deeply involved in establishing a healthy regime for ourselves as a family. It was also a good way to connect our two worlds (India and the US) through tea, especially when we lived in the heart of a place world famous for its tea. TH: Why did you decide to start Happy Earth Tea? HET: Happy Earth Tea started one morning when my wife woke up and decided we were moving to the US. There had been a long spell of political troubles in Darjeeling hills. Having seen several years of it, we had had enough and packed up our family, drove them down the broken up road of the hills and with two children in tow emerged in a small village of upstate NY where my wife's mother lived. Once we were settled in a cozy neighborhood of Rochester, NY with a fantastically supportive community, I had learned to drive on the right side of the road, and fix my children American style PB&J lunches I then decided to revive the tea business. I expanded the repertoire to include not only Indian teas but teas from China, Japan, and an herbal line. TH: What are your own daily tea rituals? Do they involve your whole family? HET: Every morning before the children wake up I try to sit down with a couple of teas for a tasting exercise. I think mornings are best when your palate and mind are calmest and clearest. I use a porcelain tasting set that I have from India, roughly made by I love them for their sentimental value. They were among the first sets I bought nearly 10 years ago. During the exercise I try to discern the nuances and complexity of the tea and play around by changing the brewing parameters. 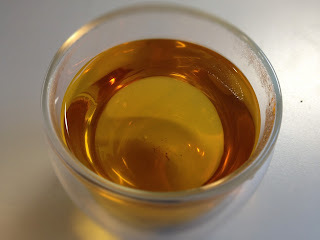 During the day I will often make tea gongfu style and my kids love it. They most enjoy making loud slurping sounds. It is hard to explain to them that you only do that when tasting tea, and you cannot do that while drinking water during dinner! I love to have them during the afternoon ritual because I cannot drink all that tea by myself. During the weekends my wife and I sit down in the afternoon and drink a pot of tea. As much as I enjoy it, it always rankles that she makes better tea than I. I just the she has a natural tea instinct. TH: In previous conversations you mentioned you started a "Rochester Tea Society". Can you elaborate on this, and how you reached out to tea lovers in the community? HET: I think it is every tea lover's dream to be part of a regular club/society where one can go and enjoy a cup of tea with great company. Tea that way is a social drink. Of course there are monks who sustain their solitude with tea, and other solitary souls who find comfort in tea but tea mostly inspires a convivial feeling. Because I could not find a tea society in Rochester, I thought it would be appropriate for me to start one. While most of our early sales happened online I had started to sell from a studio in town which was owned by a potter who made teaware inspired by the Japanese tea tradition. Here is where I first began to meet local tea lovers, and I immediately began floating the idea of a tea society with them. We meet on the last Friday of every month at the studio and explore teas from various parts of the world. Many times it is tea that members bring to share with the others. It has been a great way to learn about tea for all of us. TH: What are you favorite teas to drink? HET: I go with different teas depending on my mood. Darjeeling first flush , matcha, masala chai, high-grown Taiwanese oolong (especially Dong Ding, it reminds me of Darjeeling! ), and Lung Ching are some of the teas I relish. The only teas I just can't bring myself to enjoy are the flavored ones and I feel like a bit of a pariah in the industry because of it. Niraj, thank you so much for the interview! If you are in the Rochester, NY area you should definitely contact Niraj to find out more about the tea society. Or just go to Happy Earth Tea's website to learn more about the company and try a few teas.